The Women’s National Basketball Association, otherwise known as the WNBA, has always been a leader in establishing and promoting a strong professional sports presence for women. When the league was formed by the, it was one of the first professional sports leagues created specifically for female athletes to play basketball on a pro level. It has always been the leader in promoting diversity and inclusion of women in sport, and the first professional sports league to have an openly LGBTQ+ athlete on their roster. Sheryl Swoopes was one of the first players ever signed by the newly created WNBA in 1997. 7 years later she was one of the first professional league athletes to come out as openly gay. While it didn’t create quite the discussion or controversy that Michael Sam and Jason Collins would experience years later, it did have an impact that helped to lead the way for those athletes to come out. Facing an uncertain future after coming out, Swoopes soon found that her family at the WNBA welcomed her as their teammate and friend. She continued to represent both the WNBA and Team USA Basketball through her enormously successful playing career until her retirement in 2011. 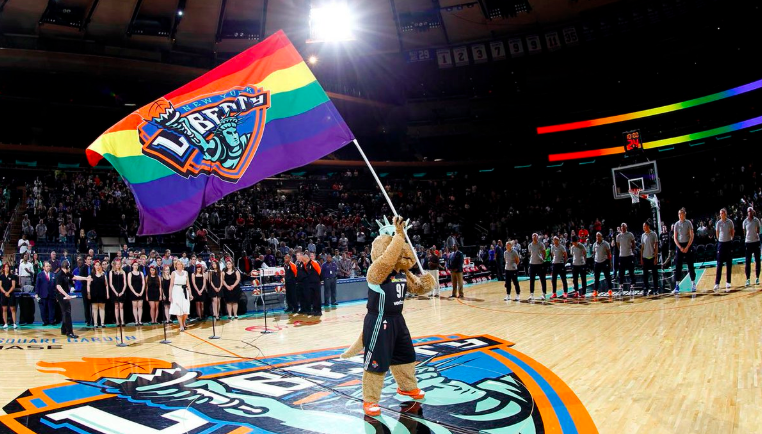 While the league itself tip toed around the issue for many years, the league as an entity started to embrace its LGBTQ+ fans and players by becoming the first professional sports league to adopt and promote “Pride Nights” at their games in 2014. While not all players were initially comfortable with this level of inclusion, Layshia Clarendon with the Atlanta Dream has been working with the league to educate about inclusion and support of their LGBTQ+ fans and players. WNBA players have continued to be more outspoken on social issues, including Brittany Griner expressing her opposition to an Anti-Trans bathroom bill that the Texas legislature attempted to pass last year. While there’s still a lot of progress to be made, the WNBA has shown their support for the LGBTQ+ community by continuing to represent their players by sponsoring many PRIDE nights throughout the month of June, participation in Pride festivals and parades and featuring Pride-themed merchandise. They are continuing to lead the way by breaking down walls and barriers for female athletes and openly lesbian athletes as they continue their mission for equal representation in professional basketball. Many WNBA teams have hosted successful Pride Nights this last year and we are looking forward to seeing more next year!